Can I tell you a secret? Though if you knew me in my childhood or in America, it is perhaps not such a secret. I'm terrible at keeping a space, any space, tidy. While plenty of people share design secrets about "less is more," my life motto since birth has been MORE IS MORE. Why settle for less? In childhood I had the messiest room of anyone I knew. And it was partially because I had more stuff than anyone I knew (I collected a lot of things. One thing was plush monkeys. You can read about that here). A big part of my problem is that I am incredibly sentimental. If I were an actress and had to cry on cue, I could do it like a pro because just looking at something I treasure can start the waterworks. There's something about the way my memories are tied to tangible stuff that makes me want to hang onto everything. And if you ever come to my home, you'll see there isn't a single item in it that doesn't have a story attached to it. (If you do come over, you're welcome to test me on this. I love telling stories!) Sometimes I feel like I can't let go of something because it would be like letting go of the memory, or the person who gave me the item. It's a weird sensation, but I'm far from alone on this. To make matters worse, when I was 14 every single item from my childhood -- along with everything my family owned except about two weeks worth of clothing, a few photo albums, and two stuffed animals -- were completely destroyed in a random, senseless accident. Irreplaceable items, gone. Every day items that make up a home, gone. No choice in the matter, just the lucky chance that we had a few things with us when we lost everything else. It affected each member of my family differently, but in my case I went from being sentimental to near-hoarder of anything that might at all be important, and even if something wasn't important, I could elevate it to treasure status because I was the girl with no tangible proof of a childhood or young teenage life, no old birthday cards, no puppy-love letters, no baby toys or scrapbooks. And so I don't get rid of stuff, and my childhood room, my college bachelor apartment, my California house, my Shanghai apartment... they were (or are) filled to overflowing with stuff. So much stuff. Since moving out of my parents' house right after high school graduation, I have lived in 19 homes. Nineteen different addresses, in twenty-four years. That's an average of a new home every 16 or so months. And just to make things fun, that's nineteen different addresses between five different countries. When I mention the number of moves, including the international ones, the number one comment I get is, "Wow, you must be so good at organizing and purging stuff! I bet you're a pro at knowing what the essentials are and letting everything else go! Can you teach me your ways?" I'm horrible at organization. I have a hard time letting go of even brochures or tourist maps. And for me, everything can be an essential! Expat life doesn't help... apart from America we've lived in Tokyo, Hong Kong, Macau, and Mainland China, which is our current home of FIVE record years (and so yes, if you're good at math, that means several of our previous homes we only lived in for 9-12 months!). Living in a country which is not your own where you don't speak the language can present big challenges. We have to bring everything, just-in-case we can't buy this or that there. And every time someone else repatriates or moves away, I'm always happy to take anything anyone is willing to hand off. After all, if they found it handy and useful, then surely I will too, right? We have a spare room which is frequently filled with guests, and no matter what they might need, I'm certain I have it on hand. (Some friends call that "hospitality." I think it's more "hoarding.") The only plus side to living abroad? Inexpensive household help who keep the huge collection of things at bay and who make me look like I actually am the domestic goddess I might have been in a different lifetime. 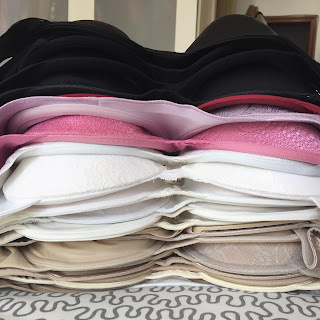 I have tried many times over the years to get organized. My beloved mother and my dearest mother-in-law have helped with many of our moves, either at the packing up end or the unpacking end (if you ever need to create a functional kitchen from scratch, my mother-in-law has skillzzz worth paying for!). But nothing ever stays organized. Everything is quickly overflowing. I've frequently done very drastic moves, like completely emptying all the closets and cupboards (or the entire office) and putting it all back together again in new storage bins or bookcases, but no matter how I rearrange it, it's still too much stuff. 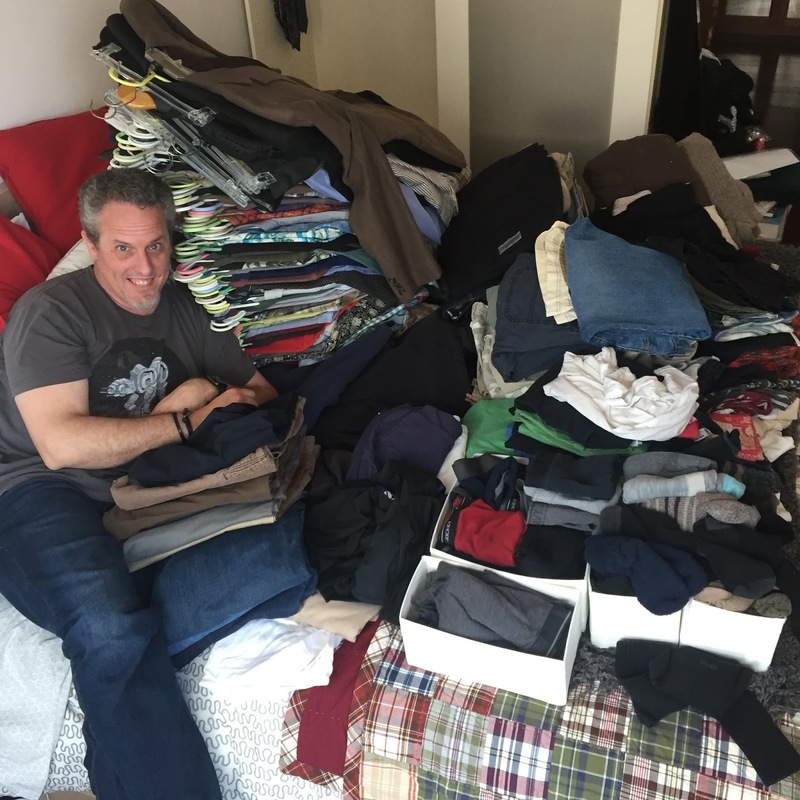 When we moved from Los Angeles to Macau in 2011, I got rid of what felt like an extraordinary amount of stuff. And then we moved into a flat that was 3,000 square feet, the largest home I've ever lived in. So everything had a place, and it was all behind cupboards. Then we moved to Shanghai into a smaller flat of "just" 2,000 square feet. Unfortunately, it had no built in storage whatsoever. Everything we owned was pretty much out in the open at all times. Last summer we moved into another flat across town which was smaller and had one less bedroom. The office has moved into my bedroom and the spare room looks like a storage space, because there's nowhere to put anything. This February our family went to America for five weeks over the Spring Festival holiday (Chinese New Year). We left China with two suitcases full of our clothes and gifts for friends and family, but we returned with nine suitcases, four carry ons, and four backpacks, filled to the weight limit with new clothes, new kitchen gear, new shoes, new books, new stuff. We've been back in China for ten weeks and we still haven't found a place to put about 75% of the stuff we brought back with us. That's depressing. A lot of things have been overwhelming lately, things that have absolutely nothing to do with the state of my house or the number of items I have. And I don't know about you, but when things start to get out of control, I tend to find something, anything, that actually is within my control, and then do something about it. And because one of the things that was out of my control was the health of my husband and oldest son, I was spending an extraordinary amount of time in my home, all day, every day, taking care of them for five weeks (three weeks for my husband, two weeks for my son). When you're trapped at home, you notice a lot more about your home. And what I noticed was the amount of stuff that surrounded me wasn't actually making me happy. The things I really wanted to put on display or hang on the wall were still in boxes or stacked behind doors because there was no place to put them. Because I traveled out of town for work in the month after we moved into this flat, it wasn't me who unpacked and put things away, it was our ayi (housekeeper) who has been with us for nearly five years. And I'm not complaining about having help (#firstworldproblems), but by the time I got back home, things were in place and being used and objects at rest tend to stay at rest and it was easier to just leave things as they were instead of actually gutting everything and putting it back in a way I would have preferred. This year I'm doing the #52Weeks52Books2017 reading challenge, and my lucky #13 book is one that I actually first read back in 2015, The Life-Changing Magic of Tidying Up. 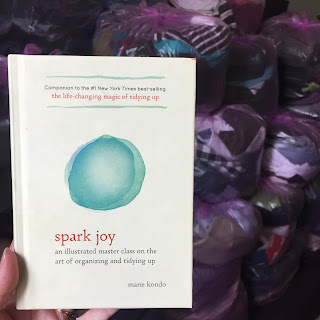 Written by a woman in Japan named Marie Kondo who is obsessed with organizing and keeping things neat and tidy, it's a whole system of keeping only things that "spark joy" in your home and letting the rest go. 2015 was a pretty awful year for my family, so it really didn't have an impact on me then because I was in no mood to let go of anything that brought even the tiniest amount of happiness, which was everything. But when I re-read it again a few weeks ago, I was like... yes. Yes. YES. YESSSSS. It's a very quick read but every word packs a punch. The entire idea behind Marie Kondo's book (a system its followers call KonMari) for lasting tidiness is to not declutter room by room, but to gather like items together and go in a marathon of decluttering each item by holding it in your hands and deciding if it "sparks joy" within you or not. So instead of doing a closet here or a drawer there, you take 100% of your clothes out of your closet, drawers, storage bins, and laundry basket, and go over each piece to decide if it brings you joy. If it doesn't, you discard it (sell, donate, trash). Very simple, and because it focuses on the positive of keeping rather than the negative of "you must get rid of things," it is very effective. 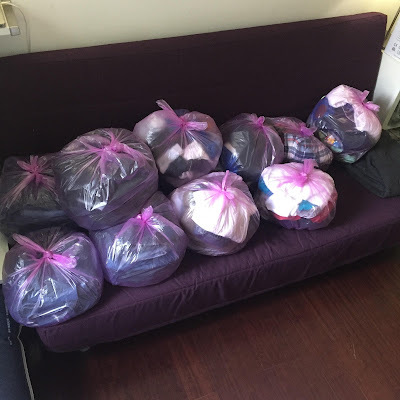 Plus, the visual image of dumping every last piece of clothing you own into one big pile is exactly the right kind of jolt a person might need to be able to only keep what you really and truly love. The ultimate goal is for every single item in your home to be something that brings you joy, and for every single item to have a place it belongs. No junk drawers full of tangled power adapters. Just a tidy home that is a joy to come home to and easy to keep tidy because everything has a place it belongs that isn't just a stack of boxes in the spare room (and how much joy can something that has lived in a box for five years actually bring you?). I decided this system was worth a try. Before I started, I read her follow-up book, Spark Joy - An Illustrated Master Class on the Art of Organizing and Tidying Up. It takes everything in the first book one step further. I wanted to make sure I completely understood what I was getting into, and that I could completely buy into it. It looked like a lifestyle that I desperately wanted to have, so I wanted to have as much knowledge about it as I could before I started. And then I took the highlights from the book, the steps and do's and don'ts, and sat down with my husband to get him on board too. 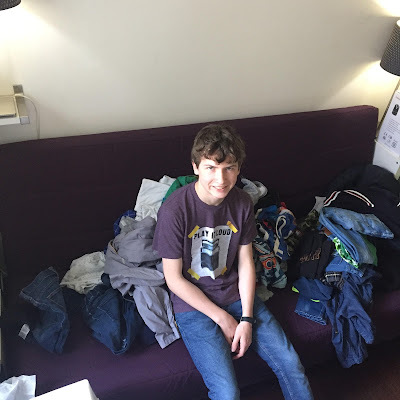 And once he was ready to start the KonMari journey, we brought the kids in to tell them all about it as well. After all, I was about to change four decades of habits and processes -- it was not going to be easy and I did not want to be sabotaged by my own family. Once everyone knew what we were going to do and was completely on board, we waited for China's three day Qing Ming Festival weekend and we tackled the first category, clothes. We started with the person who had the least clothes (Ben, my 13 year old) and finished with the person who had the most (me). I took photos of each person with 100% of every article of clothing except for each person's heavy winter coat (Shanghai winters dip into below-freezing temps, being warm sparks joy, so nobody could toss their primary parka). 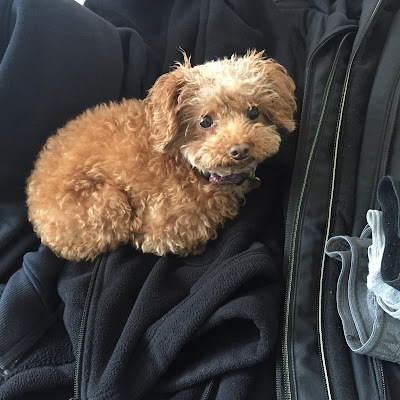 Marie Kondo has an entire system for how to fold clothes and store them, but our (manageable) goal right now is in the discarding of things that don't bring us joy, so we'll get to that next, after we've completed everything else. We broke it into four manageable categories, from L-R: underwear/socks/tank tops/pajamas/swimwear/lounge wear, tops, bottoms, and dresses/fancy clothes. 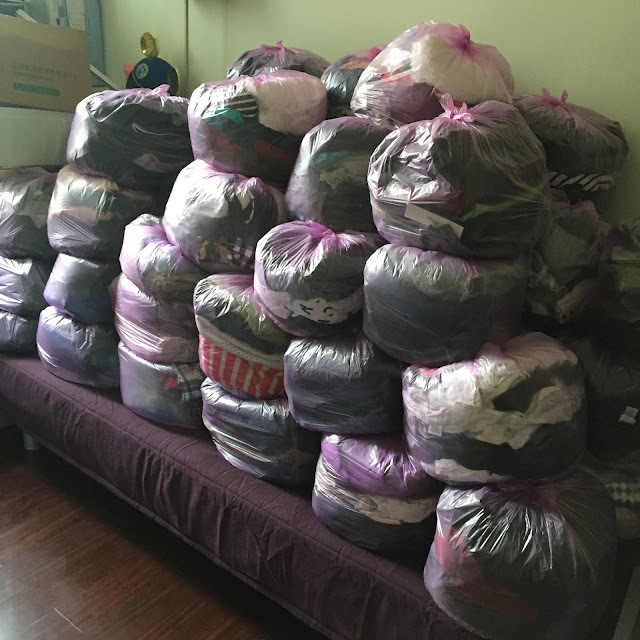 I literally cried when we started, because I had so many little storage bags of clothes shoved into the closet and under the bed and when we started pulling them out, they just kept coming and coming, like a never ending night mare. 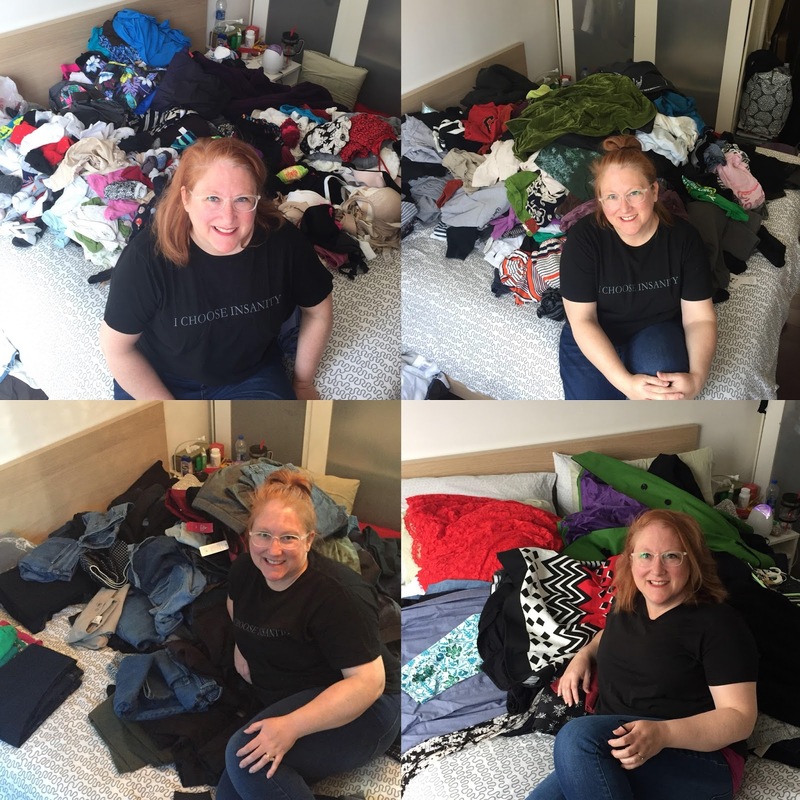 Marie Kondo recommends facing the task like a happy festival, so I put on a smile and started in. And here's the best part of all this... I feel so light and free. My closet and my drawers are now only filled with the things I love the most. I don't spend any time at all figuring out what to wear, because I know that anything I can put my hand on is something that fits me, looks good on me, and sparks joy. I could never before say that about the crammed, jam-packed space which passed for my closet that I was too fearful to do anything about because what if I needed that one pair of black dress pants that still had the tag on it from seven years ago that would be great if only I hemmed them? Or the four fancy ball gowns that I've never worn and don't even have shoes to match? 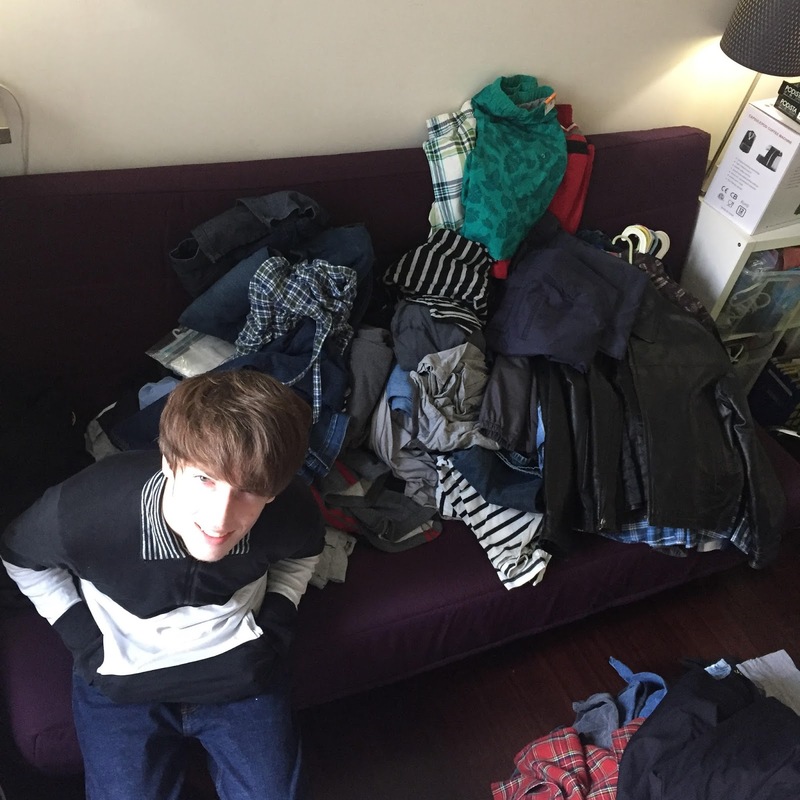 It's now been three weeks since the big clothing purge, and I miss absolutely nothing! She recommends saying thank you to each item that you discard, and while at first I thought it was a little bit crazy, I actually loved being able to hold a sweater that I'd only worn once because it was a color I never wear (any color other than black, really!) and say, "I bought you thinking it would be nice to add some color into my wardrobe. But I realized that between my bright orange hair and my bright personality, I myself am all the color I need, and I appreciate that you were here to show me who I really am, and who I really want to be. Thank you." Crazy, but FREEING. The book then recommends moving onto other categories after clothes, including books, paper, "komodo" (small items), and finally sentimental. Because you start at a mostly non-sentimental area, you are kind of a pro at discarding the things that don't spark joy by the time you get to sentimental. We zipped through books and paper, and are now slogging through komodo (we're currently doing the kitchen). I can't recommend these two books and this system enough. It's taken a lifetime, but here I am, using a system that actually brings me joy. I'm not now, nor will I ever be a "minimalist," but by discarding all the things that aren't actually bringing me any joy, I'm finding myself feeling so free and happy. And if something comes up and I really, really do need a [fill in the blank with something I discarded], I'm a creative girl who can figure out a creative way to get it, make it, or learn to do without. Life changing magic, indeed. 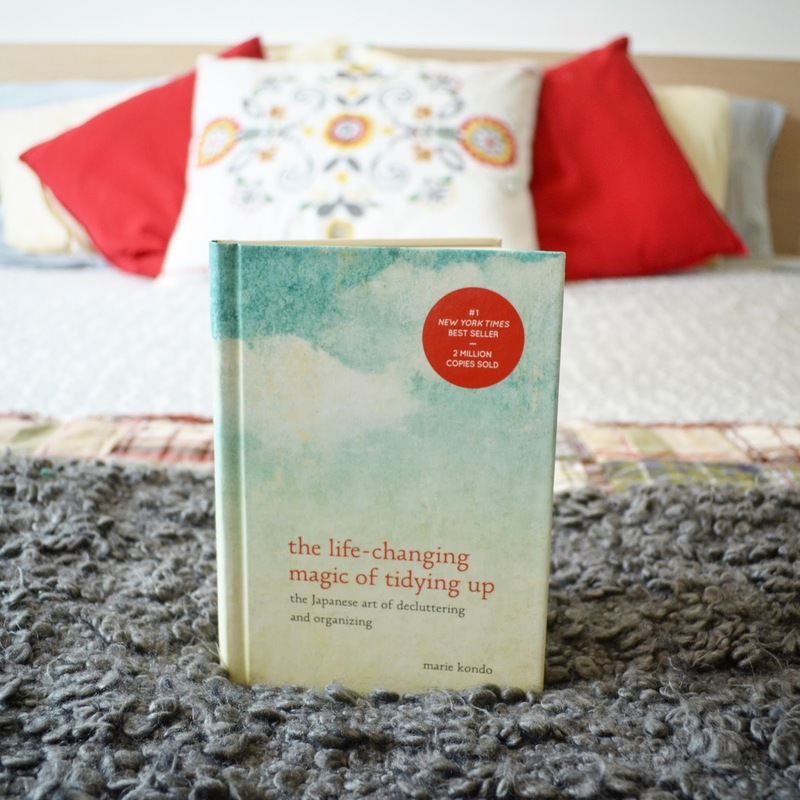 I highly recommend the two books, The Life Changing Magic of Tidying Up, followed by Spark Joy, An Illustrated Master Class on the Art of Organizing and Tidying Up. Links will take you to Amazon, where you can pick up your own copy. Please share with me your success stories if you used KonMari to clean up!